No! My sugar is melting. Melting! Oh, what a world. Spring is here! Sort of! It’s been a long time coming, but finally there are fewer treacherous sheets of ice hither and yon. But I’m missing one sheet of ice — my beloved backyard skating rink. Ben and me, testing the ice over Christmas. If you have ice rink-worthy outdoor space (and climate), it is not too early to think about next winter. We always thought our backyard was fairly flat, but when we used a level, we found out that the drop was considerable. Whichever end of your yard is lowest is going to be the deep end of the skating rink, and you don’t want to be trying to buttress several cubits of water with plywood. The summer before we had the rink, we spent some time leveling the rink space. We had fill from exacavating for a large ground-level deck/patio, so we distributed it to the low end of the yard and compacted it. We managed to raise the low end several inches. 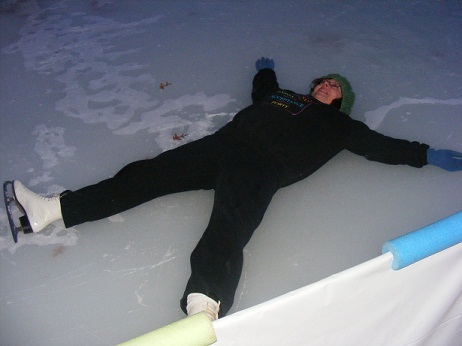 The deepest part of our rink is a bit over a foot, shallowest (at the high end) about three inches. 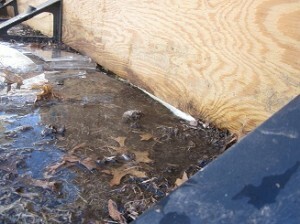 The rink, draining — imagine 40 linear feet of this over several hours dripping into your house. Keep in mind that you generally want the grade to fall away from your house. I’m not recommending building up an area near the foundation — ice rink drainage should be running away from your home! Iron Sleek (an icerink company and NOT a heavy metal band, although your confusion is understandable) uses a bracket system without boards that you can install even after the ground freezes. Their rinks do look kinda sleek. My Family Loves It has detailed instructions for DIY ice rinks — their model is what we were going to do before I found our Nice Rink on Craigslist. Guess what? Their family loves it. 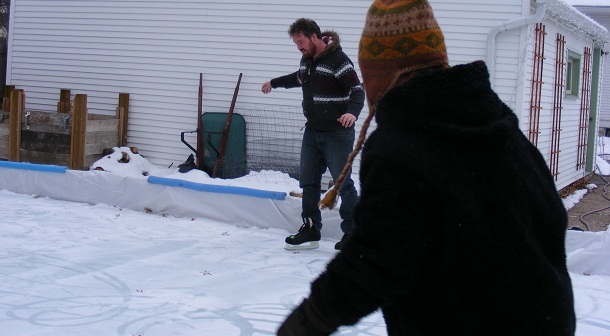 Lifehacker also has a good post on a few ways to put together a home hockey arena, including a method for a “puddle” rink (banking up snow and filling with water). A bad day skating is still a good day. It’s nice to have one thing to miss about winter! But just the one.